Wonderful knotty pine interior with full kitchen. Plenty of amenities inside and out. The Lake is also abundant with Jumbo Perch, Crappies, and large Northern Pike. Prime fishing is early and late in the season, which is nice since rates are reduced during this time. 14’ & 16’ fishing boats, 18.5' ultimate Fish & Ski Boat, a 25’ pontoon or lifts for your boat are available for rent. Fishing Guide Service is also available. The cabin feature a full kitchen including microwaves. They are fully furnished including bedding, but please bring your own towels. Each cabin has a barbecue grill, picnic table and a color cable TV. Nearby lodge and recreation room, which provides entertainment and relaxation for the entire family. The lodge has a pool table, pinball machines, video games, books, board games and more. On cool days, stay cozy in front of the large stone fireplace. For your convenience, the snack bar serves ice cream, pop, pizza and candy. Owners and operators for over 15 years. 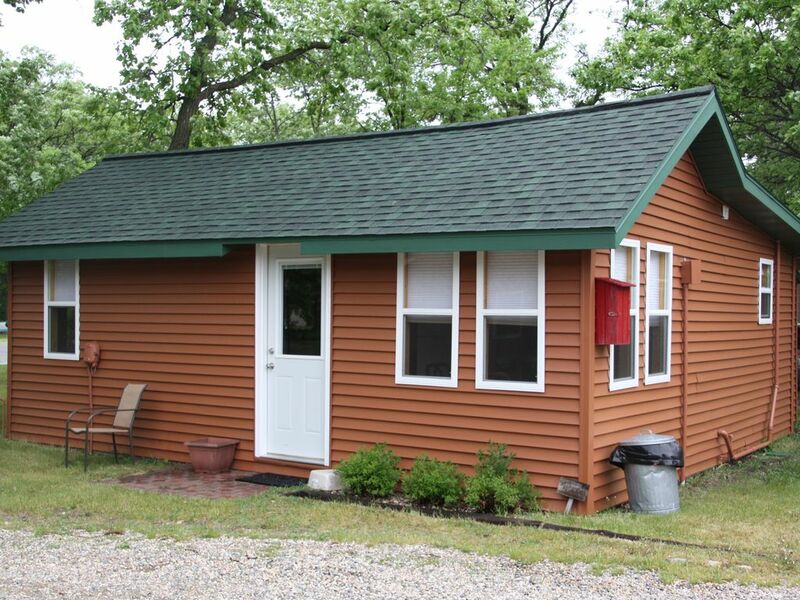 We strive to provide clean and comfortable cabin for you to enjoy Minnesota's Best Lake (We mean it! ), Otter Tail Lake. Family activities through the week. Free non-motorized water toys for guests to enjoy our sandy beach. Great lodge/game room with ice cream parlor to relax and enjoy the area's best ice cream at the end of a great lake day. On the West shores of Otter Tail Lake. Great Sandy swimming beach. If the cabin doesn't have something, just ask in the lodge. Boats available for rent by the hour, day or week. Water Toys free for guests to use. Water skis, wakeboards and tubes available for rent. My friends and I enjoyed a weekend at The Lodge on Otter Tail Lake. The cabin was clean, a perfect size for our needs, and it was nice to have AC. The owners were friendly. We loved being able to spend time on the water and went out on the kayaks and paddle boards that are free for use. I would recommend this cabin for anyone looking for a simple cabin, that is a good price, and also includes the usage of kayaks and paddle boards with your rental fee. Thanks for your review. We believe you state the essence of this cabin very well. it is a simple cabin that allows guest to have access to one of the best beaches on a lake in all of Minnesota. We are glad you enjoyed your stay. Was just what we were looking for. The cabin was nice enough though like a lot of Minnesota resort cabins, it's outdated. But if you're just looking for a place to sleep when you're not out on the lake having fun, it'll do just fine. One warning: bring lots of bottled water. The tap/well water smells badly of hydrogen sulfide (rotten eggs), which is not unusual for shallow wells near lakes. We couldn't even shower it smelled so badly. But if u want a bath, jump in the lake. The staff was very nice, friendly and helpful. Though the office/lodge was not often staffed at times. The beach area is nice with lots to keep the kids entertained. Several good places for eats and drinks nearby, but many are packed during peak times. Nearby town of Battle Lake is a good place to go for supplies and to eat when other places are packed. We'd definitely stay again though we'd prepare a little differently. Thanks for your review. We hope you enjoyed your time on the water. We historically have had great tasting water with no adverse smell. Being a licensed resort in the state of Minnesota, the department of health tests our drinking water yearly. This year we had a clean test as we have the past 10+ years. Our water softener was low on salt during your stay. We did fill it after others alerted us to the issue. It has gotten better, but we are still working to get it back to the good tasting water we are used to. Great family destination with so many fun things for the kids! We planned a last minute long weekend getaway and really lucked out finding this gem. The owners are very accessible and accommodating. Our cabin was definitely in need of updates, but it was clean and had everything we needed in it. Part of the "old school" charm of renting a cabin on the lake. Considering how little we were inside it didn't matter to us. Free paddle board, paddle boats, pads for jumping off of, and the lake is nice and shallow for quite a ways out so don't have to worry about little ones as much. Boat rentals available onsite for fair prices. We had a great time and would definitely return! Located in the center of Otter Tail County with over 1000 lakes. Plenty of water recreation through out the year. Marina service include boat rental (fishing Boat, Pontoon and Jet-skis) by the hour, day or week.